Pacific Business Park is ideally located in Sahibabad Industrial Area, just 1.5 km. from Anand Vihar ISBT & Metro. It is 800 mts away from Kaushambi Metro station Many companies like TCS, Ultratech Cement, Ultratech RMC, IDBI Bank, Hindustan Times, TATA AIA Life, Syska etc. have their offices in the premises. The property is surrounded by large business houses like Bhushan, Bisleri, Havells ,Dabur, Paharpur Cooling Towers and a host of MSME companies . The premise has a 150 room Clarks Inn Suites Hotel which has ample space and meeting rooms to cater to visitors and conference room requirements. 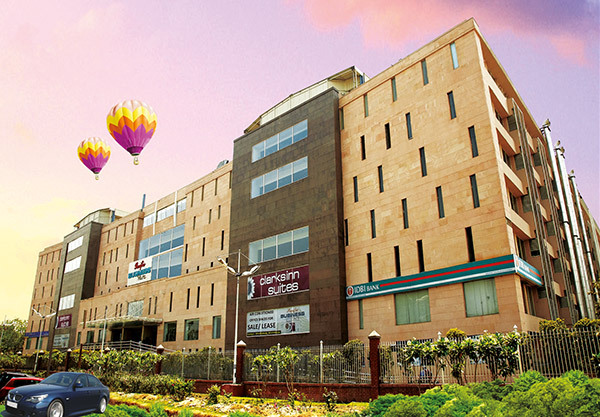 We operate a shuttle between the premises and Kaushambi Metro Station during office opening and closing hours. The same is complimentary to the occupants of the Premises. We have a 33 KVA connection from the Electricity Board ensuring the lowest dependency on DG power in the area.